1. Charpentier 1:52.176. 2. Fujiawara 1:53.047. 3. Fabrizio 1:53.920. 4. Sanna 1:53.951. 5. Curtain 1:54.722. 6. Chambon 1:54.814. 7. Antonello 1:54.926. 8. Corradi 1:55.021. 9. Nannelli 1:55.095. 10. Parkes 1:55.318. 11. Fores. 1:55.413. 12. Le Grelle 1:55.477. 13. Veneman 1:55.565. 14. Goi 1:55.649. 15. Miksovsky 1:56.050. 16. Berta 1:56.123. 17. Baiocco 1:56.224. 18. Cogan 1:56.406. 19. Jansen 1:56.432. 20. Stigefelt 1:57.535. 21. Haarala 1:57.888. 22. Lauslehto 1:58.007. 23. Penna 1:58.665. 24. Enjolras 1:58795. 25. Harms 1:59.107. 26. Szkopek 1:59.770. Troy Corser has qualified on provisional pole for the Monza round of the World Superbike championship with Alstar Corona team-mate Yukio Kagayama maintaining Suzuki's dominance by qualifying second quickest. 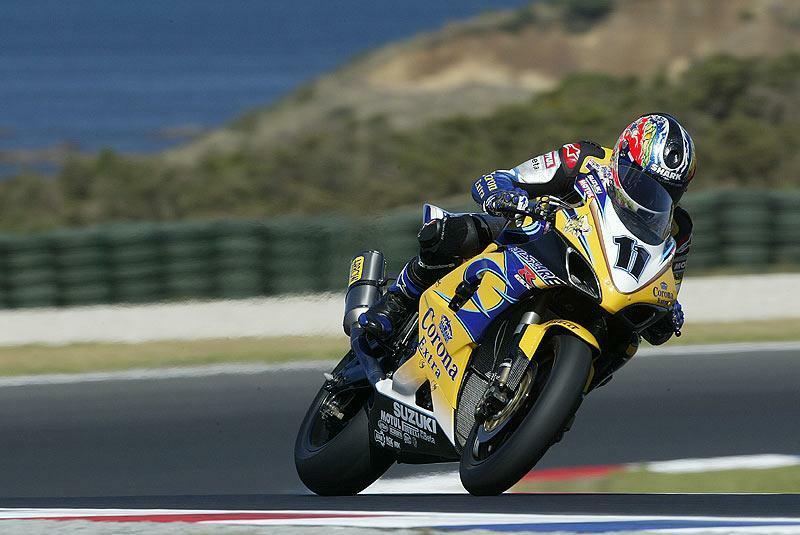 Corser was the only rider to drop below one minute, 48 seconds in qualifying, with a best time of 1:47.878 in 17 laps. Kagayama posted 1:48.113, to put himself ahead of Karl Muggeridge, Gianluca Nannelli and James Toseland. Troy Corser has gone quickest in the first free practice session for the Monza round of the World Superbike championship, in preparation for the racing on Sunday, May 8, 2005. The Australian completed 23 laps en route to a best time of 1:48.210, covering more laps than anyone else, except for 20th placed Fonsi Nieto. Karl Muggeridge went second quickest on the Ten Kate Honda, with 1:48.702, followed by the two factory Ducatis of Regis Laconi and James Toseland. 1. Corser 1:48.210. 2. Muggeridge 1:48.702. 3. Laconi 1:48.744. 4. Toseland 1:48.831. 5. Kagayama 1:48.863. 6. Haga 1:49.534. 7. Walker 1:49.669. 8. Vermuelen 1:49.808. 9. Nannelli 1:49.915. 10. Pitt 1:49.928. 11. Pedercini 1:50.039. 12. Cardoso 1:50.133. 13. Chili 1:50.763. 14. McCoy 1:50.978. 16. Martin 1:51.139. 17. Borciani 1:51.252. 18. Bussei 1:51.329. 19. Clementi 1:51.379. 20. Nieto 1:51.560. 21. Alfonsi 1:51.633. 22. Gimbert 1:51.828. 23. Velini 1:51.974. 24. Bostrom 1:52.593. 25. Abe 1:52.736. 26. Praia 1:52.742. 27. Blora 1:53.980. 28. Mazzali 1:56.242. 29. Nickmans 1:57.724. 30. Conforti 1:58.058. 31. Pedersoli 1:58.356. 32. Vizziello 2:40.469. In the Superstock 600cc support class, Brit Barry Burrell has gone 11th quickest in free practiceon a Honda CBR600RR.